The WordPress 3 menu system allows a theme to register theme locations, which allow users to associate a particular menu to be printed at a particular point within a site layout. UberMenu setup requires you to select which Theme Location to target and turn into an UberMenu. 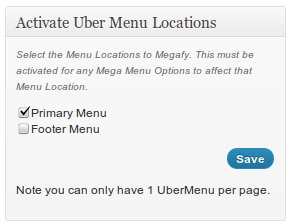 If you do not select a Theme Location, UberMenu will not automatically be applied to any menu on the site. In the Appearance > Menus screen, activate the appropriate Theme Location in the Activate UberMenu Locations meta box. If no theme location is available in Appearance > Menus, the theme does not properly use theme_locations and does not meet UberMenu’s requirements . You can use Manual Integration to add UberMenu to your theme. Easy Integration will be required.